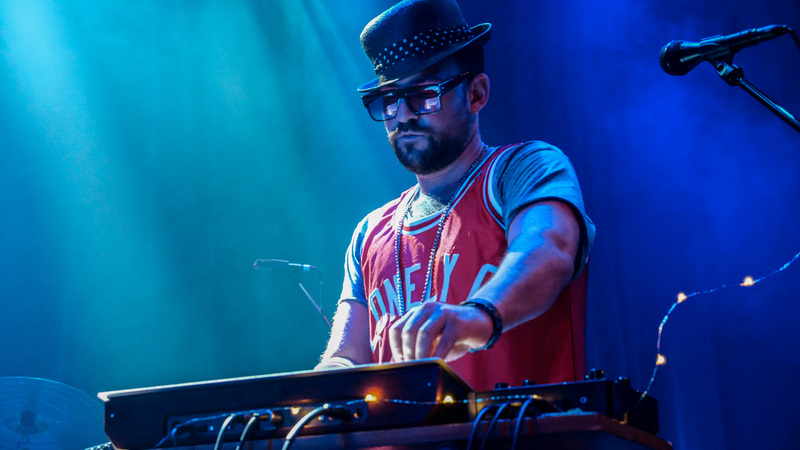 We sat down with Charles Levine, one half of Soul Clap and frontman of new band and project Lonely C, to find out why he wanted to take his show on the road, how the setup works, and what's next for Lonely C and the Soul Clap duo. Listen to Lonely C's debut album here. Why was it important to you to develop a live show alongside DJing? "I've been hungry for an opportunity to put together a live show for many years. Then in 2017, Soul Clap performed live on the main stage at Movement Festival featuring Amp Fiddler, Dames Brown, Hazmat and Phil Celeste and that REALLY confirmed my desire to push forward with live music. As a producer, this new Lonely C album contains a lot of material with my vocals, guitar, keys, etc and my co-producer Morgan Wiley is such a beast of a keyboard player it just felt like it would be a mistake to not try to take this album to the stage!" "I've always wanted to get as far away from computers and DJ equipment as possible. I think the further from a recorded file or locked sequence would allow the songs to stretch out and make room for jamming and special moments." How has the set up changed over time? "The performance won’t always be five people and won't always be this crew of players. We also have a paired down version which features me, Morgan Wiley and different singers and musicians depending on where the show is taking place. Of course I’d love to have Kendra Foster come and perform her work, but she is a busy woman, so fingers crossed that will work out when the time is right!" What’s your set up now and how does it work? "Well, the set up works like this, at the core is a sampler/sequencer which in this case is the Pioneer DJ Toraiz SP-16. Elements of the album are loaded onto there, then we play and perform around that. I'm singing, playing synths and guitars, Morgan Wiley is triggering the sequencer and playing a few more synths, Caito Sanchez sings, plays guitars, drums and percussion and Lollise sings the Kendra Foster songs with her own signature style. Then for the trumpet solo on 'Ain't Worried' we've had both Greg Paulus perform who originally recorded the take and Carter Yasutake." What are the main changes in the set up? "Things are always adjusting and changing, synths are coming and going. We're realising we need this or we don’t need that. I think that’s the beauty of it, the set up grows as we grow as a group, as we grow as players and as the music itself grows into its live performance form." "Try to eliminate your expectations because the live moment will always reveal its true self"
How has the live show affected the way you work in the studio if at all? "I don’t know if my studio style has changed too much, but I will say I'd like to create a body of music specifically designed to play live, rather than adapting the recordings to a live setting. I think it would be cool to create music with specific gear and instruments that are the same ones that get used on stage." "Rehearse as much as you can, try to eliminate your expectations because the live moment will always reveal its true self, get as much sound check time as possible and perform as much as you can. It took a long, long time to become a good DJ, it will take much longer to become a great band!" What's next for Soul Clap and the Lonely C project? "There are two more Lonely C live shows coming up, December 7th at The Electric Pickle in Miami for Art Basel and then January 25th in Brooklyn at Come On Everybody for the Soul Clap Records night there. Also I’ve created a sample pack for Splice that will be available some time in December and features samples and sounds directly from or inspired by the album. Then on the Soul Clap tip, we've finished a remix for Louie Vega of a song he did with Anane and the legendary Patrick Adams called 'Rebel Nation'. Also Eli and I have been in the studio working on new Soul Clap material including some incredible stuff with Lori Lava of Sha-Lor fame, no release date yet on this stuff but it is hot hot hot!" Lonely C's album 'Charles & Tribulations' is out now. Buy it here.